Pres. Bryan welcomed Visitors ADG Jill Barker, Jenny Ingram and Debbie Bish, Rtns. Heather, Gay, Noel L, and Noel S, and Rotary Partners Robyn & Jeanette. Apologies were received from Rtn. Graeme who had received a late RACV callout. July – The Start of a New Rotary Year As the month of July continues, Club projects are revisited, new ones considered and plans consolidated as new Presidents fit into their leadership roles while those such as President Bryan who are facing a second term, look forward to a more relaxing time. District Governor Peter has commenced his club visits accompanied by not only Anne, but Oddball. We look forward to welcoming them to Rochester in November. Assistant District Governor Jill took the opportunity to introduce herself to members and spoke of the Rotary Leadership Institiute and the New Members’ Seminar. Welcome to Rotary, Jenny. With the assistance of ADG Jill, Pres. Bryan inducted Jenny Ingram as as member of the Rotary Club of Rochester. 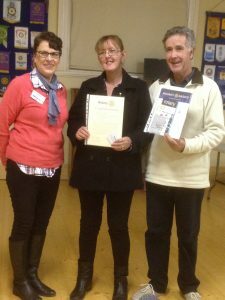 Over the past months Jenny has been a tireless worker at a number of the club’s activities such as the Steam Rally, BBQs and assisting with Meals on Wheels. We look forward to a long and satisfying association as you now officially give Service above Self. Bus Shed and Murals: Over the past months Sec. Heather & Treas. Noel have met with Campaspe Council representatives and have consulted with Heritage Victoria & the Department of Environment, Lands, Water & Planning. It is apparent from these consultations that the inclusion of the shed and the murals do not fit the footprint of the Court House Grounds and that building permits would not be granted. It has been decided that no further action be taken as to the placement of the shed and the murals in the Court House grounds. Discussions are to be held with Shire Officers to determine the site of the shed while the Mural Committee is to be consulted as to the best location for the Club’s two murals.